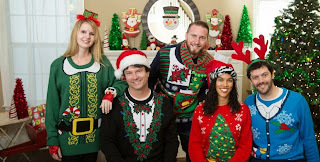 Believe it or not, if you do an internet search with the key words “ugly Christmas sweater” you will find pages of results, and you may wonder why so many people want an ugly Christmas sweater. Ironic as it is, this tacky item of clothing is a necessity for many holiday occasions and it’s an example of kitsch. Kitsch is defined as art, objects, or design considered to be in bad taste because of excessive garishness or sentimentality, but sometimes appreciated in an ironic way. Ugly Christams sweaters possess all of those qualities. There are ugly Christmas sweater contests, ugly Christmas sweater parties, ugly Christmas sweater theme days at work, and ugly sweater runs. December 18 is officially National Ugly Christmas Sweater Day! In the past, this type of sweater was probably a nostalgic item or a funny gift you received and saved to wear once each year. Designed to be as unattractive as possible and often considered hideous, these awful sweaters have slowly changed from a fashion “don’t” to an ironically cool and trendy holiday necessity. What is undeniable, the overly-festive, obnoxious Christmas sweater creates laughter and humor while it brings out memories of home and childhood.